Learn how to make a Christmas cheesecake recipe for a perfect dessert to serve for the holiday. As much as this dessert is loved all over the world, it is sure to please. Of course all desserts (or recipes in general) need to be special in some way for this special day. This can be done by making them unique and luscious in taste or by decorating them for the special occasion. Cheesecakes of all shapes, spring form, Bundt or tube shaped cakes and molds can be made special by placing on a plate and decorating with red and green; red and green candied cherries or maraschino cherries and sugared rosemary leaves work very well. The holiday season is a special time of the year for all of us and a perfect time for learning how to make a Christmas cheesecake recipes. Christmas is a magical time of the year. It is a time for family get togethers; a time for nostalgia and remembering years and people of our past. This is also a time to bring out our family’s favorite recipes that have been handed down from our parents and grandparents; like me even my older sisters. Traditions can be added to by adding to these recipes. Perhaps your mom passed you a plain Christmas cheesecake recipe so you could add a new sauce to go with it. Make it more special and pass it on. When you learn how to make a Christmas cheesecake recipe, you will find it can usually be made in advance and placed in the freezer until you are ready. The holidays are a time for entertaining whether it is a large gathering or small and intimate; it can be just family or friends. Whatever the occasion we all want to remain stress free to enjoy the celebration. By planning ahead this dessert can be the perfect dessert for any holiday occasion. If you enjoy cheesecake for the holidays you might also like to try these popular flavors for the holidays Pumpkin, peppermint, cranberry, Amaretto, Rum, and Baileys. These are popular for the winter and autumn seasons. Eggnog has always been very popular at the holidays so this eggnog Christmas cheesecake recipe is a natural for this special time of the year. Preheat oven to 350F degrees; butter 9 inch spring form pan. Combine crumbs, melted butter and 2 tablespoons sugar in small bowl. Press crumb mixture over bottom of pan and 2 inches up sides; chill. Beat cream cheese on medium speed until creamy; gradually add ½ cup heavy cream beating constantly. Stir in liqueur; pour batter into prepared pan and sprinkle with nutmeg. Bake for 45 to 50 minutes or until cake is set; cool to room temperature for 1 hour. Run a knife around sides of pan to loosen cake; remove sides and refrigerate at least 4 hours. Serve with whipped cream and hazelnuts. This makes a very nice Christmas cheesecake recipe. 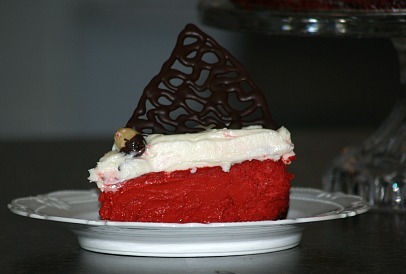 The deep red filling with white topping makes a dramatic presentation for Christmas dinner. Combine cookie crumbs, melted butter and 1 tablespoon sugar. Press into bottom of 9 inch spring form pan. Beat 3 packages (8 ounces each) softened cream cheese and 1 ½ cups sugar on medium speed until creamy. Add eggs, cocoa powder, sour cream, buttermilk, 2 teaspoons vanilla, vinegar and food coloring. Beat mixture until just combined and blended; pour into prepared pan. Bake 10 minutes at 325F degrees; REDUCE HEAT TO 300F degrees and bake 75 minutes longer until set. Turn oven off and let cheesecake set in oven for 30 minutes longer; remove from oven. Run knife around pan to loosen cake from sides; let set to room temperature. Cover and refrigerate for 8 hours. Beat 3 ounces softened cream cheese and ¼ cup softened butter until smooth and creamy. Gradually add powdered sugar and vanilla; beat until smooth. Spread evenly over top of cheesecake; remove sides of pan and garnish. 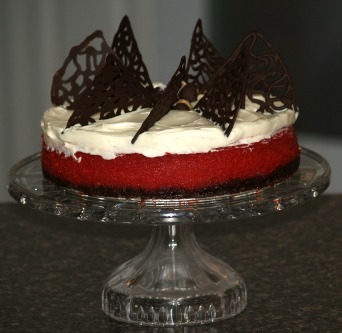 Although this is not red in color it makes a wonderful dessert to match any Christmas cheesecake recipe. Apples are traditionally American and apple cinnamon aroma brings out the best at Christmas. Preheat oven to 450F degrees; grease 9 inch spring form pan. Cream butter and 1/3 cup sugar in a bowl; stir in ¼ teaspoon vanilla. Add flour to mixture and blend; spread in bottom and 2 inches up sides of prepared pan. Combine and mix on medium speed cream cheese, ¼ cup sugar, egg and ½ teaspoon vanilla. Spread cream cheese mixture evenly over the pastry. Combine and blend the apples, ½ cup sugar and cinnamon; spoon over filling. Bake for 10 minutes at 450F degrees; REDUCE TEMPERATURE TO 400F degrees. Bake for 25 minutes longer; sprinkle with pecans last 10 minutes. I wouldn’t be without apricot recipes at Christmas. Although this is more cake than a Christmas cheesecake recipe, the cheese gives it a wonderful texture and so delicious. Combine apricots, raisins, ¼ cup sugar and coffee in saucepan. Bring to boil, reduce heat, cover and simmer 15 minutes; drain reserving 1 cup coffee liquid. Cream together 1 ½ cups sugar, cream cheese, butter and vanilla. Sift together the sifted flour and baking powder several times; blend into creamed mixture. Fold in drained fruit and pecans; turn into well greased and floured tube pan. Bake in preheated oven at 325F degrees for 65 to 70 minutes; cool completely and invert from pan. Make sauce: Combine reserved liquid and cornstarch in saucepan. Cook and stir until mixture bubbles and thickens; cool slightly. Serve over slices of cake. This is not quite a Christmas cheesecake recipe but this cream cheese coffee cake is delicious for holiday breakfast. If desired top with sliced maraschino cherries for color. Cream together butter and cream cheese; gradually add 1 ¼ cups sugar beating until light. Add eggs beating well after each addition; stir in bananas and vanilla. Combine flour, baking powder and soda; blend well into banana mixture. Combine pecans, 2 tablespoons sugar and cinnamon; stir into batter. Pour batter into greased and floured Bundt pan; bake for 45 to 50 minutes or until pick comes out clean. Cool for 10 minutes in pan; remove from pan and cool completely. Spoon glaze over coffee cake. To make Glaze: combine powdered sugar and warm water; stir until smooth.